A magical combo of pumpkin and chocolate will enchant your senses in any season! The notes of pumpkin are neither overpowering nor underplayed. The soft cookie serves as the perfect cushion for a chocolate witch’s hat. This recipe is inspired by Very Best Baking by Nestle . Yields approximately 60 petite pumpkin cookies. Whisk together the flour, baking soda, powder, spices and salt. Set aside. Add in the pumpkin, egg and vanilla. With a mini ice cream scooper, drop rounds of dough onto parchment lined cookie sheets. Freeze for 2 hours or ideally, overnight. Ninja Note: Freezing as you are probably aware avoids cookies merging and melting into each other in a hot oven. Bake in in a 350 degree for 16 to 18 minutes. Cool completely. Whip up the frosting with the powdered sugar. Scoop into a piping bag with a large round #2A tip. Pipe circles onto the cookies. 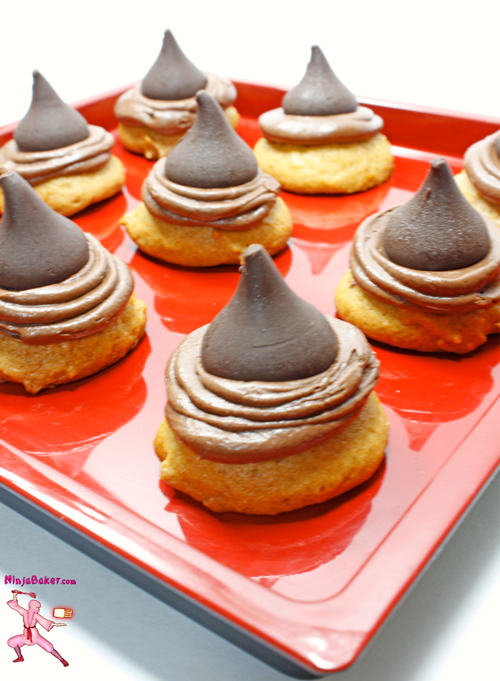 Place chocolate kisses into the centers for the peaked witches’ hats.